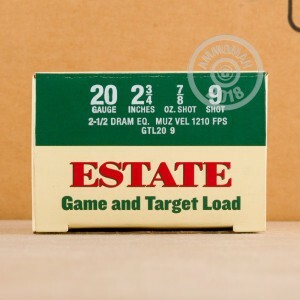 This 20 gauge ammunition from Estate is a mild-recoiling birdshot load suitable for a variety of sporting purposes including small game hunting and target shooting. Each shell in this box of 25 fires 7/8 ounces of #9 shot at 1,210 feet per second. 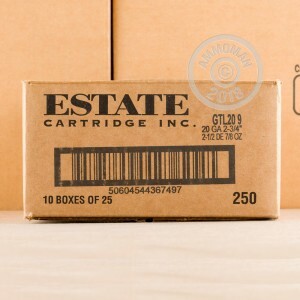 Estate is a brand of ATK/Alliant Techsystems, owner of many notable ammunition manufacturers including Speer and Federal. 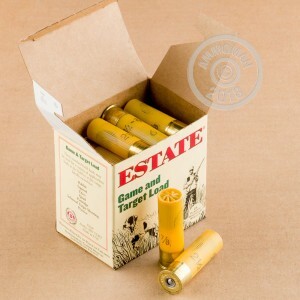 Estate is best known for its economical and dependable shotshell ammo, but has also branched out to centerfire cartridges recently. Stock up on this affordable ammo from AmmoMan.com and rack up extra savings in the form of free shipping on all orders over $99!